Bread is one of those universal foods that every country and cuisine have. Each claims their own take on a loaf of bread and learning about bread is probably one of my favorite parts of this little worldly experiment I’ve signed myself up for. Bread is cheap. It’s filling. It’s delicious. And something about making your own loaf of bread makes you feel accomplished and productive. And one of these months I’ll finally build that sourdough starter…but, for now, Persian Barbari Bread. This is a really easy dough to work with and doesn’t require much rise time at all. 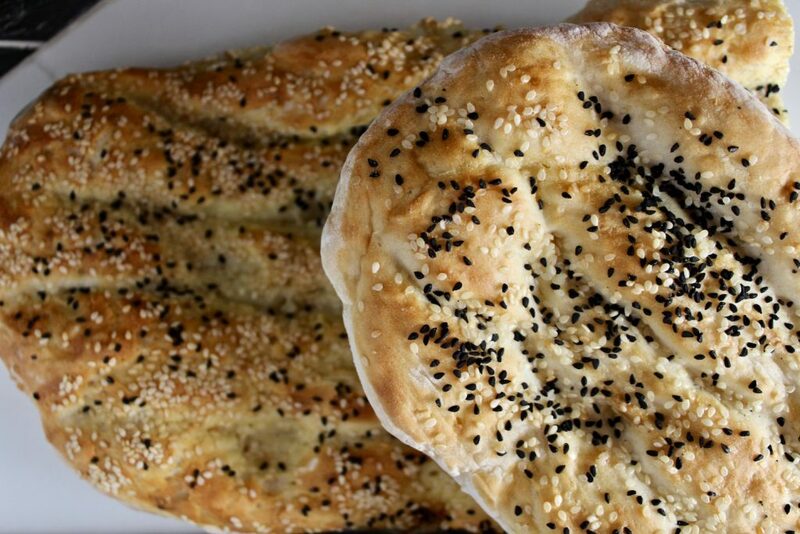 The Persian Barbari Bread is a great recipe to have on hand when you need bread quickly, but want something that has some flavor to it. Also, it’s so cool looking! I’d never heard of Nigella seeds before this recipe. They look like black sesame seeds and are used a lot in Middle Eastern cuisine. 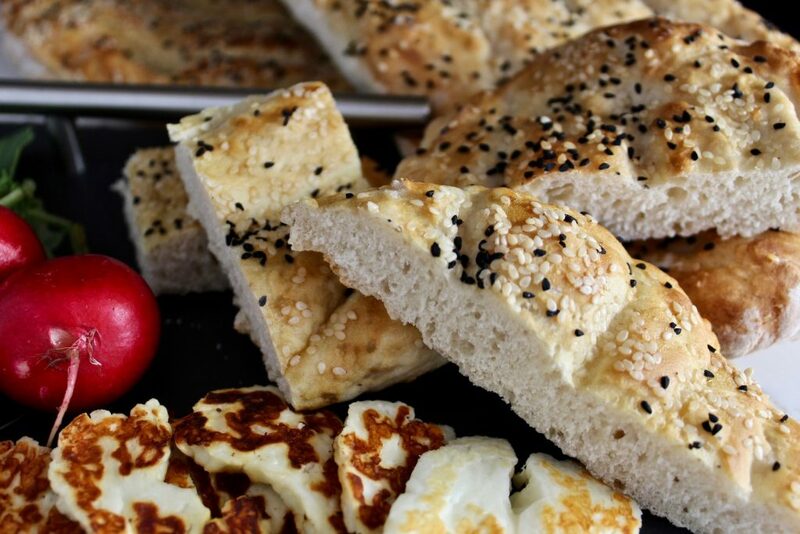 They’ve got a kind of herby-oregano flavor to them and add personality to this bread. If you can find it – use it. Bread flour is the only thing I’d say you must have for this recipe. 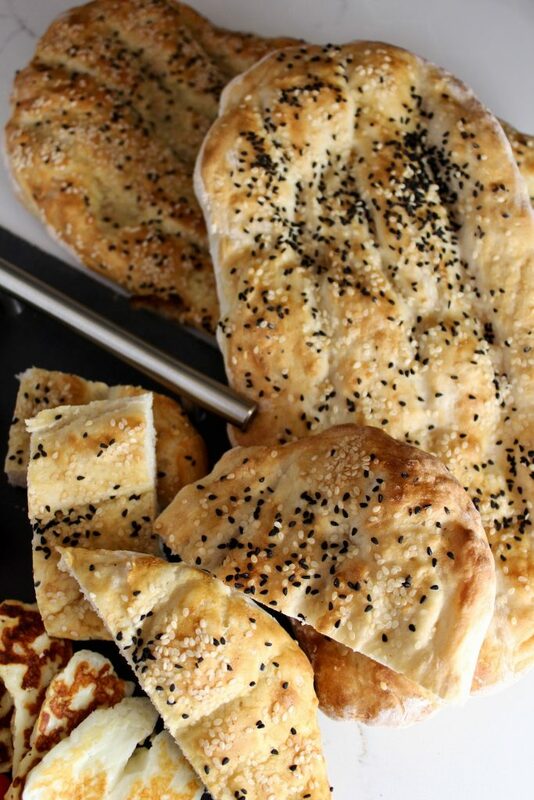 All-purpose flour won’t necessarily give you the airiness and flavor that you’d expect with Persian Barbari Bread. If it’s all you have – give it a try and let me know how it turns out. I found this bread to be a little undersalted as is. I would suggest adding coarse salt to the top of the bread after the glaze OR pair with salty feta or salted butter. 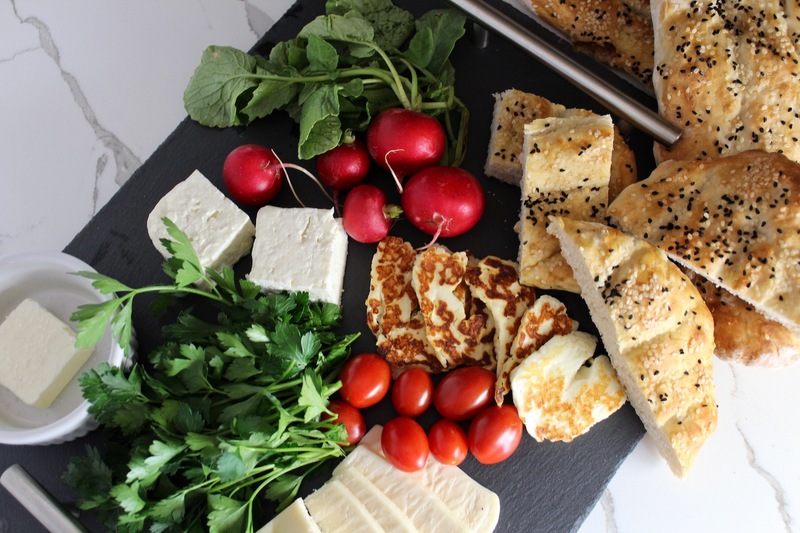 I made myself a little Persian Herb Platter (Sabzi Khordan) but had more cheese than herbs (whatever I’m from Wisconsin) so it turned out to be a hybrid. 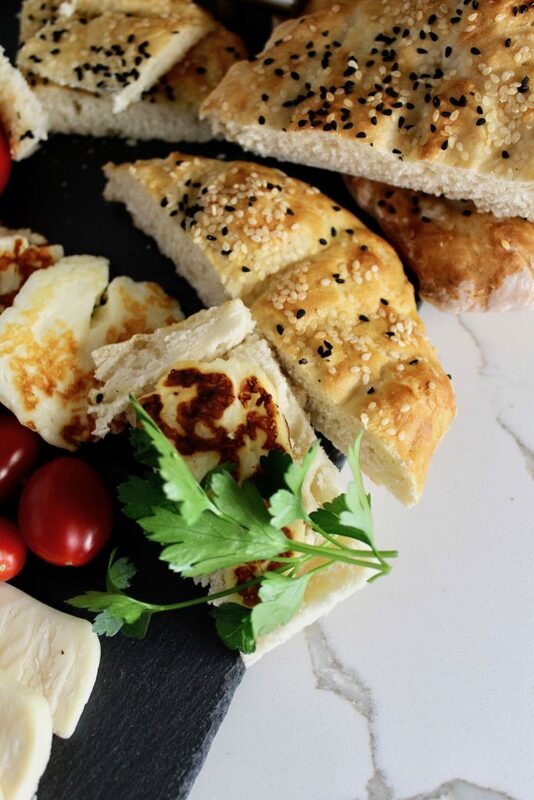 This Persian Barbari Bread is great for snacking with your favorite cheese, herbs, veggies, and dips. I haven’t made it into a sandwich yet but I’m not realizing that’s a brilliant idea -so I’m going to do that now. In a small bowl combine 1 cup warm water, the pinch of sugar and the packet of yeast. Tightly cover with plastic wrap and let sit on the counter for about 10 minutes. If at the end of 10 minutes you don’t see a layer of froth on top, start over with a new packet of yeast. Measure out 4 1/4 cup bread flour into a large bowl. Add your yeast mixture, 1 cup warm water and 2 tsp of salt. Combine with a wooden spoon and knead in the bowl for about 3-4 minutes. The dough is sticky, do not add more flour! Cover the bowl in plastic wrap and let sit for about 25 minutes until the dough has roughly doubled in size. Turn your oven on to 500F. If you’re using a pizza stone, keep it in the oven so it gets hot. Make your glaze next. Add the flour and cold water to a small pot and break up all the flour completely. Add the baking soda and hot water. Bring to a simmer so the mixture gets completely incorporated and takes on a cloudy quality. Remove from heat, the mixture will thicken as it cools. Take your dough and divide it into three. On a floured surface, gently roll each portion into the flour to create a ball. You’ll end up with three balls, covered in flour but not kneaded into the flour. Let them rest on the counter for about 10 minutes, uncovered. Cover a baking pan with parchment paper. Take a ball of dough and shape it into an oval – about 6×9. You’ll lay it on the parchment and make indentations with your fingers down the length of the dough, about 3 or 4 lines. Brush the glaze on the dough, using 1/3 of the mixture. Then sprinkle with seeds. Let this rest for a few minutes, then stretch the dough slightly to end up with a shape that’s about 6×14. Either keep this on the baking pan and put it in the oven or transfer it to your pizza stone. Bake for 10-12 minutes in total. You want a medium brown crust on the outside. Repeat this with the other two loaves. 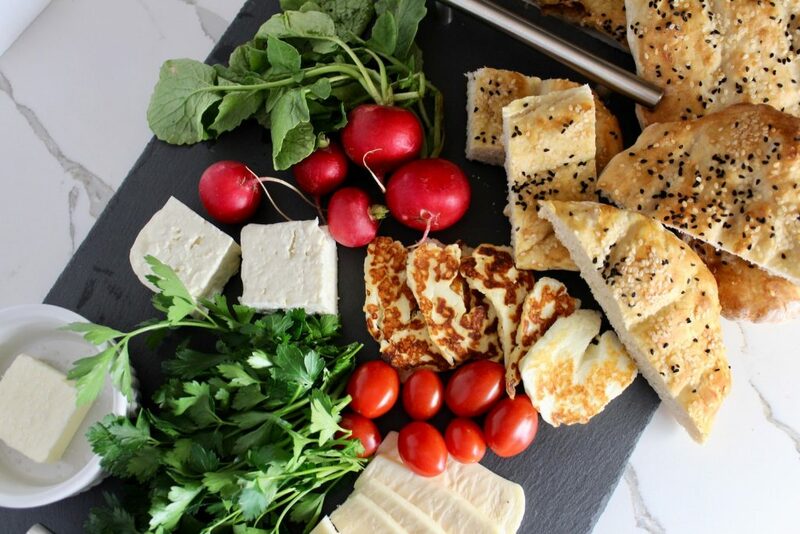 Serve with feta cheese, butter, herbs, olives, or eat it straight from the pan.